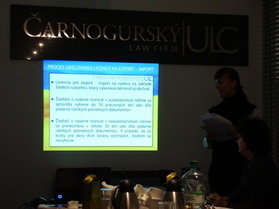 The Čarnogurský ULC Law Firm in partnership with its Ukrainian branch Čarnogurský & Vishnyakova ULC based in Kiev, repeatedly organized expert seminar for representatives of companies, entrepreneurs and also for individuals who are interested in expanding their business activities eastern of our borders and plan to enter the Ukrainian market. 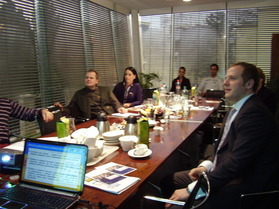 The seminar took place on 24th January 2014 at the Čarnogurský ULC Law Firm in Bratislava. The main lecturer was Helen Vishnyakova, managing partner and attorney of Ukrainian branch of an international law firm Čarnogurský & Vishnyakova ULC and co-lecturer Ilya Rogac from the Čarnogurský ULC Law Firm. Considerable interest and generous participation testifies the fact that tense internal situation in our eastern neighbour does not discourage our enterpreneurs from investing and doing business in Ukraine . 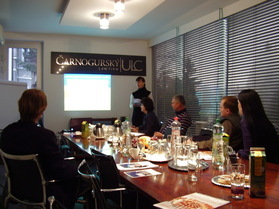 The content of the seminar was mainly presentation of information about how to enter the Ukrainian market. The process of establishing the business partnership in Ukraine was also explained in more detailed manner. Participants were familiarised with Ukrainian tax system, as well as with social and health insurance contributions for employees in Ukraine. Customs procedures and protective mechanism for entrepreneurs in the Ukrainian market was also marginally mentioned. Lecturer Helen Vishnyakova and Ilya Rogac also provided participants with a range of practical advice and presented various situations encountered by their clients in practice Helen Vishnyakova also pointed out specificities of trade with Ukrainian partners. Free under final discussion, participants were given an opportunity to discuss individual questions related to their areas of business. Due to the great interest in the seminar we would like to take this opportunity to announce that Čarnogurský ULC Law Firm plans to organise similar seminars in the close future.